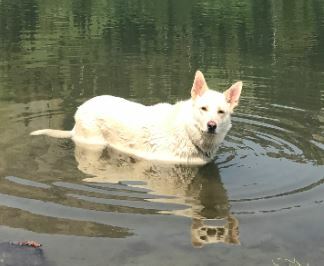 My 5 year old White Shepherd, Coho, was first diagnosed with HSA August 30, 2017. He had a break out of two tumors about three weeks prior, shortly after receiving his rabies vaccine in July. The normal veterinarian did a biopsy on the tumor and let me know my options. He advised me that Chemo was expensive for dogs and I didn’t have much hope. At that time, I contacted Summit Veterinary Referral Center in Tacoma, WA. They did a scan and found tumors internally but did not think there was much of a chance, however, they provided me options on chemotherapy and oral medicine as well as herbal supplements. My dog was my best friend and I was going to do everything I could to treat the cancer, especially since he was only 5 years old. We started chemo immediately and the tumors shrank and almost disappeared within four months of the six rounds of Chemotherapy. He was on a keto diet as well as I hand made all of his meals. In March of 2018, being off the Chemotherapy for three months, the tumors came back. We went back on chemotherapy however, this time the his immune system got smarter and the results we saw prior we did not see again. Coho passed away on May 30, 2018, which was 10 months longer than anyone expected. I cherished every day with him. The Veterinary Cancer Society is proud to share the stories of the many people whose pet received wonderful treatment from one of our VCS members. Many of our doctors often make a donation to VCS on behalf of the pets that they have treated. In other cases, pet owners have made donations to VCS in honor of the oncologist who treated their pet. We thank all them all for the donations which allows us to provide educational opportunities for our members each year. Honoring these beloved pets who have touched our lives. The Veterinary Cancer Society is devoted to improving the treatment of cancer in small animals.